Can you believe the oldest millennials are now 37? That means it’s time to retire the tired jokes about millennials killing mayonnaise, breakfast cereal and casual dining, and discover the new truths: What is Generation Z eating? And how can restaurants win them over? How is Gen Z defined, anyway? Anyone born between 1981 and 1996 (ages 22 to 37 in 2018) is a millennial; those born later are part of a new generation, the Pew Research Center says. That postmillennial cohort is called Gen Z (although it’s possible the name may change). So, what will shape the values and preferences of Gen Z? It’s a mistake to think of them just as younger versions of millennials. Remember, millennials grew up with 9/11 and its aftereffects, the historic election of Barack Obama and the 2008 recession. These events feel like history to Gen Z. Like the millennial generation, however, Gen Z is incredibly diverse, health- and environment-conscious, and deeply interconnected. Millennials planted the seeds for what Gen Z is eating now. The younger generation has grown up eating at fast-casual restaurants. They take for granted that food will be customizable, that ingredients will be natural or clean, and that they’ll always have vegan/gluten-free/organic options. They’re not especially loyal to brands. Most Gen Xers grew up with a limited array of fast-food, casual dining, and ethnic dining options. Suburban and urban Gen Zers, on the other hand, have an almost endless array of choices. Bibimbap? Laotian? Burritos? Ramen? Grass-fed burgers? Sushi? Falafel? Perhaps as a result, Gen Z is less brand-loyal than preceding generations. German grocery store chain Aldi is aggressively pursuing these “brand agnostic” Gen-Z shoppers with store-brand lines of kombucha, gluten-free bakery items, vegan foods and $8 rosé. They’re accustomed to spending money at restaurants. 78 percent of Gen Z spend most of their money (after paying tuition and bills) on food, a UNiDAYS study found. Nearly half spend $10 to $20 per order, and 15 percent pay more than $20 for a meal. They value transparency. Gen Z diners want to know everything about their food. For them, it’s not enough to know it’s local, Joe Sardina, Vice President of Operations for Freshëns, told Hamilton Beach Commercial. Now, "they want to know where did that corn come from, how far did that chicken travel?" Not only that, but they care about labor practices and fair wages. They’re adventure seekers. “This generation has literally never had stability. … It’s just their MO,” Marcie Merriman, a cultural strategist for Ernst & Young, tells QSR magazine. “They’re constantly looking for something that’s different and new and fresh. For these restaurant brands and chains to continue to win them, they’ve got to constantly be giving them something different.” If a particular treat is also pretty/elegant/weird enough to be Instagrammable, so much the better. They have short attention spans. 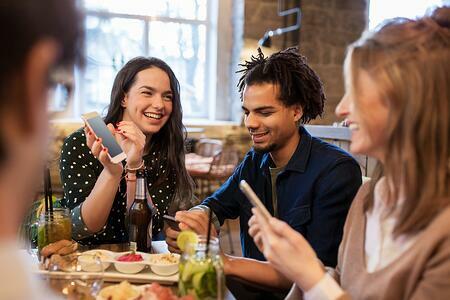 While Gen Z does appreciate spending face-to-face time with friends in restaurants, when they’re hungry they want to eat now. They’re also grazers, often choosing snacks and small meals. Meet their eat-right-now, eat-all-day desires with mobile-enabled order-ahead and delivery options, as well as grab-and-go items. How is your business adapting to win the hearts of Gen Z? Tell us about it! Were always looking for foodservice innovators to feature in this space.